To see traveler tips, ratings, reviews, and tourist information, go to the Fresno trip itinerary planning site . Minneapolis to Fresno is an approximately 8-hour flight. You can also drive; or take a bus. Traveling from Minneapolis to Fresno, you'll gain 2 hours due to the time zone difference. Plan for warmer temperatures traveling from Minneapolis in January, with highs in Fresno at 59°F and lows at 40°F. Finish up your sightseeing early on the 4th (Fri) so you can travel to Beverly Hills. Beverly Hills is a city in Los Angeles County, California, United States, surrounded by the cities of Los Angeles and West Hollywood. For ratings and other tourist information, refer to the Beverly Hills day trip planning app . Do a combination of flight and bus from Fresno to Beverly Hills in 3.5 hours. Alternatively, you can drive; or take a bus. In January, Beverly Hills is somewhat warmer than Fresno - with highs of 67°F and lows of 50°F. On the 5th (Sat), you'll travel to West Hollywood. West Hollywood, occasionally referred to locally as WeHo, is a city in Los Angeles County, California, United States. To find maps, photos, and other tourist information, read West Hollywood trip itinerary planner. West Hollywood is just a short distance from Beverly Hills. In January, plan for daily highs up to 67°F, and evening lows to 50°F. You will leave for Santa Monica on the 5th (Sat). 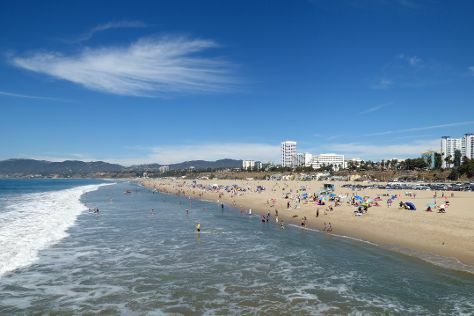 A famed resort town since the early 20th century, Santa Monica sits on the picturesque Santa Monica Bay, bordered on three sides by the city of Los Angeles. Start off your visit on the 6th (Sun): wander the streets of Montana Avenue, then tour the pleasant surroundings at Santa Monica State Beach, and then take in the waterfront at Santa Monica Pier. For where to stay, maps, and more tourist information, read Santa Monica vacation maker site . Santa Monica is very close to West Hollywood. In January, plan for daily highs up to 67°F, and evening lows to 50°F. Finish your sightseeing early on the 6th (Sun) to allow enough time to drive to San Diego. 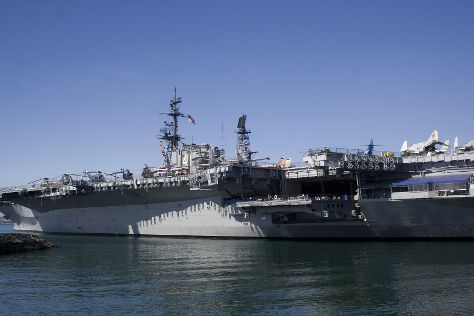 Kick off your visit on the 7th (Mon): examine the collection at USS Midway Museum and then tour the pleasant surroundings at La Jolla Cove. Keep things going the next day: kick back and relax at La Jolla Shores Park. To find ratings, photos, where to stay, and other tourist information, read San Diego trip maker app . Traveling by car from Santa Monica to San Diego takes 2.5 hours. Alternatively, you can do a combination of tram and train; or do a combination of bus and flight. In January, plan for daily highs up to 67°F, and evening lows to 51°F. Wrap up your sightseeing by early afternoon on the 8th (Tue) to allow enough time to travel back home.